Kevin Rudd’s tobacco tax increase: good policy? It’s now been a few weeks since the tax hike on cigarettes – I’m interested whether anyone in the field is seeing an increase in people deciding to quit? I know there’s evidence on the link between price and use, but I’m guessing it takes more than a few weeks for that to kick in for most people? This entry was posted in Federal Government, General debate and tagged smoking on May 18, 2010 by James. Australian Government’s new illicit drug strategy: more of the same? 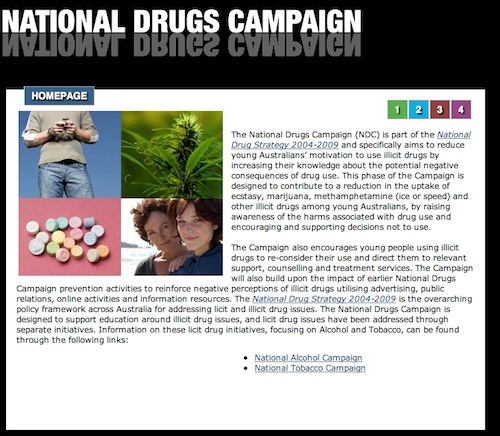 The Federal Health Minister has launched an Illicit Drug Campign to go along with its Tobacco and Alcohol campaigns. It’s a campaign that involves lots of information around the dangers of illicit drug use, that aims to “decrease motivation” of young people to commence use. I’m all for education and knowledge, but I just get the feel this is just more of the same. There doesn’t seem to be any real differentiation from the decades of previous information and it just doesn’t seem that engaging. Again, campaigns like this probably do help but I’m interested in your thoughts: if you had the same budget, what would you do to ensure an effective and engaging campaign for young people and illicit drugs? The Rudd Government today launched the next stage of its hard-hitting $17 million advertising campaign to combat illicit drug use in Australia. This campaign aims to tackle drug use by presenting the physical and psychological impacts of illicit drug use. It urges young people to decide against drug use and directs users to support, counselling and treatment services. This campaign is about young people understanding the consequences of illicit drug use, asking them to ‘face facts’ and emphasising the damaging effects drugs have. Too many young Australians don’t understand the very real and dangerous impacts of taking or using illegal drugs. Ecstasy is made in filthy, makeshift labs, using toxic ingredients like battery acid and bleach. The toxicity of each pill varies and the potential for overdose is in every single pill. There is no ‘quality control’ over the manufacture of drugs such as ecstasy. In 2007 more than one third of the people aged over 14 had used an illicit drug at least once in their lifetime. increased ecstasy use by young females aged between 14-19 which is up from 4.7 per cent in 2004 to 6 per cent in 2007. The campaign features print, outdoor, radio and in-venue advertisements depict real-life situations. The advertisements, which will appear from this Sunday, were developed with the advice of clinicians, law enforcement officers and young people. Further information, fact sheets and advice is available at www.australia.gov.au/drugs or by calling the free national hotline: 1800 250 015. This entry was posted in Federal Government, General debate on February 26, 2010 by James. It’s been a substantive week for the ATOD sector from a government policy viewpoint, with the release of the Return on investment 2: evaluating the cost-effectiveness of needle and syringe programs in Australia 2009 report by the Commonwealth Department of Health and Aging and the steady progress towards realisation of a nationwide Preventative Health Agency. For those working at the NSEP coalface the Commonwealth report doesn’t contain any great surprises: the program has saved hundreds of millions of dollars overs its lifetime (Alex Wodak has a спалниnice piece over at Crikey on the report). The challenge now falls to both the Commonwealth and State governments to follow-through and further entrench the validity of NSEP. Hell, they could even expand its reach. There’s a chance for some governmental innovation. Australia’s first ever Preventive Health Agency will soon be established following the passage of important legislation in the House of Representatives today. The Agency is a key part of the Rudd Government’s decision to invest more in preventative health measures than any other government in Australia’s history. The legislation is now with the Senate for consideration. It is essential that this Bill be passed without delay so that the agency can commence work on 1 January 2010. The creation of this agency responds to calls from health professionals for Australia to establish – as many other countries have done – a dedicated agency to focus exclusively on driving the prevention agenda and combat the complex challenges of preventable chronic disease. The agency will guide health ministers in their task of curbing the growth of lifestyle risks driving chronic disease. It is a role requiring national leadership, capacity to work across sectors and portfolios, and an oversight role for surveillance and monitoring. The agency will bring together the best expertise in the country and play a key role in gathering, analysing and disseminating the best available evidence and evidence-based programs. Its prevention activities will engage all Australian governments as well as employers, businesses and other sectors, to benefit every community in the nation. The new preventive health agency will concentrate on reducing the burden that preventable health problems are already placing on the workforce, and ensure Australia’s productive capacity is maintained. The agency will receive $133 million over four years, from the Government’s record $872 million COAG Prevention Partnership funding. Strong support for the agency has been expressed by key players in the preventive health field such as the Public Health Association of Australia, and this is important in ensuring the agency’s success in forging cohesiveness in national preventive health efforts. The preventative health agency legislation holds some promise and it’ll be interesting to see how much ideology enters the debate. You can expect the AMA to go in hard on the issue of medical funding not beign sacrificed on the altar of prevention. There may also be some argy bargy over the taskforce being another incremental step toward Commonwealth takeover of health. Beyond that, it’s really hard to see any Senator taking a strong stand unless it’s to claim the model is wrong or that there’s not enough funding for it to work effectively. Over to you: are you encouraged by the NSEP report and the taskforce legislation? Do you see it as a positive step toward better health services delivery? This entry was posted in Federal Government, General debate on October 22, 2009 by James. The Alcohol and other Drugs Council of Australia (ADCA) congratulates the Senate for passing the alcopop taxation legislation, but is calling for taxation reform to go even further. “This issue has been delayed too long. There is no doubt that targeting these pre-mixed high-alcohol sweetened drinks is an important part of addressing issues of national binge drinking, ” ADCA’s Chief Executive Officer, Mr David Templeman, said today. “We appreciate the Rudd Government continuing to fight for this tax, given the evidence from the Australian Taxation Office showed since the new tax rate for Ready-To-Drink spirits (alcopops) has been in effect, total spirits consumed decreased by 8 per cent.” he added. ADCA believes that the tax will discourage underage drinking and delay the onset of drinking by some young people. This is imperative given the 2007 National Drug Strategy Household Survey showed more than 20% of 14-19 year olds consume alcohol on a weekly basis and the risk of accidents, injuries, violence and self-harm are high among drinkers aged under 18. “One of the recently revised alcohol guidelines specifically targets children and young people under 18 years of age – advising that NOT drinking alcohol is the safest option. We know that these alcopops are particularly attractive to young people, and so raising the tax level is part of addressing that problem,” he added. Such a move also fits with the announcement in October 2008 by the National Preventative Health Taskforce Paper Australia: The Healthiest Country by 2020 setting a target to reduce the prevalence of harmful drinking for all Australians by 30%. ADCA as the national peak non-government (NGO) body representing the AOD sector, will continue to strive to engage with Government to deliver the National Binge Drinking Strategy and Preventative Health Taskforce priorities aimed at creating a healthier Australia. This will require significant investment in prevention and treatment. Mr Templeman said that statistical data supplied by the alcohol industry must be consistent across all States/ Territories. Accurate data collection had now been confirmed by the Senate Standing Committee on Community Affairs as a crucial element to properly understand and address alcohol-related harm. The point raised over data collection is incredibly valid – the only excuse left for inferior data collection is a lack of will and funding across the government and non-government sectors to tackle the issue. This entry was posted in Federal Government, Legislative issues and tagged alcopops on August 15, 2009 by James. Hard-hitting ads targeting ice, ecstasy and marijuana will be rolled out from today, as part of an $18 million national campaign. The ads confront young people with the dangers posed by these harmful drugs, and will include print, television, cinema, outdoor advertising and internet ads. • Ice users are at risk of drug-induced psychosis which may lead to aggressive and violent behaviour. They also suffer physical problems including damaged teeth, gums and skin lesions, and are at greater risk of stroke, panic attacks, anxiety, and severe depression. • Ecstasy users are at risk of chronic sleep problems, cracked teeth through grinding, high blood pressure, dehydration, anxiety, nervousness, hallucinations, severe depression, thermal meltdown and death from heart failure. • Marijuana users are at risk of psychosis (particularly the earlier marijuana use is initiated), increased risk of depression, risky sexual behaviours and chronic respiratory conditions. The rates of drug use in society are still too high. In 2007, of Australians aged over 14 years, 38.1 per cent had used an illicit drug and one in three had used marijuana. Of Australians aged 20-29 years, 23.9 per cent reported using ecstasy and 16 per cent had used methamphetamines such as ice at least once in their lifetime. The ads use slightly revised versions of earlier ads, in order to reinforce the message that these drugs are dangerous. The television commercial Don’t Let Ice Destroy You, was produced under the guidance of expert clinicians, and law enforcement officers were also consulted. The campaign also directs drug users to important points of support, counselling and treatment services that are available in communities throughout the country. This campaign is one part of more than $800 million the Government is investing over five years in tackling the scourge of drug abuse. Comprehensive strategies can be worthy, but am I alone in worrying whether a broad, mainstream campaign is the best way to target illicit drug users? This entry was posted in Federal Government on April 19, 2009 by James. COAG: more money where it’s needed? I’ll append the extensive snippets below from the COAG Communique kindly provided by Gino Vumbaca on the ADCA list. First though, some thoughts on the details. My initial reaction is that for the ATOD sector, there’s not a significant gain except in the indigenous health area. The proposed social marketing campaign may include alcohol, tobacco and possibly some illicit drugs – hopefully it’s not just a continuation of current approaches. I’d like to see some real investment and research into Web 2.0 and preventing ATOD issues amongst particular age groups. Onto the actual communique, and wold love to hear your thoughts below as well.  to halve the gap in employment outcomes between Indigenous and non-Indigenous Australians within a decade. Since the targets were agreed in December 2007 and March 2008, all governments have been working together to develop fundamental reforms to address these targets. Governments have also acknowledged that this is an extremely significant undertaking that will require substantial investment. COAG has agreed this year to initiatives for Indigenous Australians of $4.6 billion across early childhood development, health, housing, economic development and remote service delivery. In giving effect to this commitment to closing the gap on Indigenous disadvantage, COAG agreed to the first ever NP agreement in October 2008. This agreement comprises $564 million of joint funding over six years to address the needs of Indigenous children in their early years. As part of the initiative, 35 Children and Family Centres are to be established across Australia in areas of high Indigenous population and disadvantage to deliver integrated services that offer early learning, child care and family support programs. The funding will also increase access to ante-natal care, teenage reproductive and sexual health services, and child and maternal health services. This NP is now joined by a new National Agreement on Indigenous reform and two new NPs which cover the areas of Economic Participation ($228.8 million – $172.7 million Commonwealth funding and $56.2 million State funding over five years) and Remote Service Delivery ($291.2 million over six years). Taken together with the Indigenous Health NP and the Remote Indigenous Housing NP, these new agreements represent a fundamental response to COAG’s commitment to closing the gap. Sustained improvement in outcomes for Indigenous people can only be achieved by systemic change. Through these agreements, all governments will be held publicly accountable for their performance in improving outcomes in these key areas. National Indigenous Reform Agreement COAG agreed to the National Indigenous Reform Agreement (NIRA) which captures the objectives, outcomes, outputs, performance measures and benchmarks that all governments have committed to achieving through their various National Agreements and NPs in order to close the gap in Indigenous disadvantage. The NIRA provides an overarching summary of action being taken against the closing the gap targets as well as the operation of the mainstream national agreements in health, schools, VET, disability services and housing and several NPs. The NIRA will be a living document, refined over time based on the effectiveness of reforms in closing the gap on Indigenous disadvantage. Closing the Gap COAG Meeting in 2009 In October 2008, COAG agreed to convene a dedicated meeting in 2009 on closing the gap on Indigenous disadvantage. COAG has asked for advice on how the NPs and National Agreements will collectively lead to a closing of the gap and what further reforms are needed. In addition to this, COAG has asked for a Regional and Urban Strategy to coordinate the delivery of services to Indigenous Australians and examine the role that private and community sector initiatives in education, employment, health and housing can make to the success of the overall strategy. COAG noted that the it will work to develop a further reform proposal, including benchmarks and indicators for improvements in services and related outputs relevant to family and community safety, for consideration at the Closing the Gap COAG meeting to be held in 2009. Revised Framework of the Overcoming Indigenous Disadvantage Report In April 2002, COAG commissioned the Productivity Commission’s Steering Committee for the Review of Commonwealth/State Service Provision to produce a regular report against key indicators of Indigenous disadvantage, with a focus on areas where governments can make a difference. The resulting Overcoming Indigenous Disadvantage (OID) Report has been published every two years since 2003. COAG agreed to a new framework for the OID Report that is aligned with the closing the gap targets. HEALTH AND AGEING COAG agreed today to a landmark deal providing $64.4 billion over five years, including an additional $8.6 billion over current forward estimates. This includes $60.5 billion over five years for the National Healthcare Agreement, which reverses the cuts of the previous Agreement and provides $4.8 billion in additional base funding. In the fifth year of this Agreement, the base will increase by $1.5 billion. This means that States are, on average, better off by nearly $1 billion each year over the five years. As part of this deal, the Commonwealth is offering a $500 million recurrent boost in base funding from 2008-09, increasing the starting point for the National Healthcare Agreement from $9.96 billion to $10.46 billion. The Commonwealth is also delivering a more generous indexation formula, which currently delivers indexation of 7.3 per cent per annum to put public hospital funding on a more sustainable footing.  sustainability: Australians have a sustainable health system.  a reduction in selected potentially avoidable GP type presentations to emergency departments.  enabling infrastructure, including a national preventative health agency, surveillance program, workforce audit, eating disorders collaboration, partnerships with industry and a preventative health research fund, leading to better oversight and research into prevention, leading to improved outcomes.  reduce the proportion of adults smoking daily, averting premature deaths and ameliorating costs.  over time, a reduction in average length of hospital stay and reduction in readmissions. This means that over a five-year period, around 55 per cent of the adult Indigenous population (around 155,000 people) will receive a health check with about 600,000 chronic disease services delivered. More than 90,000 Indigenous people with a chronic disease will be provided with a self-management program, while around 74,500 Indigenous people will receive financial assistance to improve access to Pharmaceutical Benefits Scheme medicines. This entry was posted in Federal Government and tagged coag, Federal Government on November 30, 2008 by James. Earlier this month the Treasurer Wayne Swan launched an exciting new initiative that recognises the efforts of the thousands of community treasurers across the country who volunteer their time to keep community groups financially healthy. The Westpac Community Treasurers’ Awards recognise and reward the unpaid labour of the many thousands of treasurers toiling in our community groups. These Treasurers often go above and beyond the call of duty spending hours ensuring their groups meet financial obligations, formulating budgets, generating numerous spreadsheets and making sure there’s enough money in the kitty to keep things ticking. Too often, though, their efforts have gone unnoticed – Until now. The Westpac Community Treasurers’ Awards will provide prizes of $5000 in the organisational categories of small, medium and large. Importantly, the awards provide the opportunity for groups to say publicly they recognise and appreciate the great work the treasurers do for them. I encourage you to circulate information about these awards in your community and to consider nominating a community treasurer who services you think deserve recognition. This entry was posted in Federal Government, Professional News and tagged Federal Government on August 23, 2008 by James.